I’ve used this sauce in my Mushroom, Turkey and Hot Italian Sausage Lasagna, as well as in crepes. Of course you can use real milk or even a little cream if you can handle the real stuff! 1. Clean mushrooms by rubbing with a damp cloth, then slice into pieces about 2 mm thick. 2. Add butter to a large frying pan on medium-high heat. In small batches add the mushrooms, and after a few minutes of cooking, add a splash of wine. 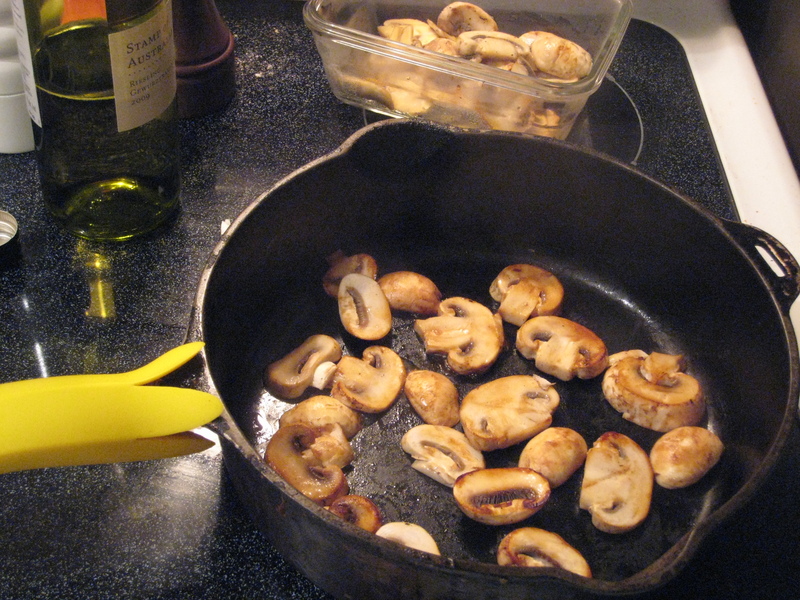 Cook mushrooms until both sides have browned. In the last batch of mushrooms add the garlic and cook as you did the others. 3. Heat the soy milk. 4. Heat 1/4 cup butter/substitute in a pot. Add the flour and cook, stirring, for a few minutes. Very gradually add the soy milk – add a little, then stir until incorporated into the flour mixture. Continue adding the milk gradually, until it has been incorporated. Add a splash or two of wine and continue to stir. If it’s very thick, add a little more soy milk or wine. 5. Season with salt and and quite a bit of pepper.